The Battle of Brandywine was the largest single day engagement of the American Revolution where nearly 30,000 soldiers (not including civilians, teamsters, servants, and other members of the army) squared off on a ten square mile area of roughly 35,000 acres. Today’s battlefield landscape encompasses nearly fifteen different municipalities with the main gateway of interpretation being our park. Brandywine Battlefield Park is simply a 52-acre park that was the epicenter of George Washington’s continental encampment but is often mistaken as being the entire battlefield itself. In order to understand how the Battle of Brandywine came to be and existed in the grand scheme of the American Revolution, one must look at 1777 in its entirety. The year 1777, deemed “The Year of the Hangman” by historian John S. Pancake, was a decisive year of the American Revolution that had a indispensable impact on the latter years of the war. Many are aware of Washington’s famous Christmas crossing of the Delaware to surprise the Hessian forces at Trenton under Col. Rall as well as the infamous winter encampment of Valley Forge, but few truly understand the events that occurred in between and the dramatic repercussions they had on the British forces as well as the Continental Army and its forthcoming alliances in 1778. The year 1776 is often seen as being very successful for the British forces under William Howe. Howe had nearly decimated Washington’s forces in New York, but the “Old Fox” escaped to fight another day. Howe, for his leadership and performance in those series of engagements was knighted by the king and became Sir William Howe. Loyalist populations flocked to New York and bore the brunt of the hardships of rebuilding and moved towards reconciliation. In late 1776, British parliament was already planning for post war retributions and was preparing to hang every rebel leader audacious enough to go rebel against their King. Nothing was more evident than their decision to abolish of the Writ of Habeaus General William Howe Corpus entirely for rebel leaders in the colonies. All in all, it looked optimistic for William Howe and his British Forces, but a series of events at the end of 1776 would drastically change that delighted mood; Washington’s crossing of the Delaware and his victory at Princeton. Throughout 1776, Parliament had, in fact, been somewhat divided on the matter in the colonies. Whig sympathizers were a minority in the shadows during the year 1776 simply because things were going so well for the British forces, so much, that they did not dare speak out against British policy towards the rebellion. However, with the events occurring at the close of 1776 and into early 1777, they had a foundation to express their opposition. Lord George Germain, the Secretary of State of North America in the Lord North government felt the pressure from King George III. He was under strict orders to bring the rebellion to a swift and just end. At the time, had three generals of the British army in North America to rely on and he needed to do something quickly in order to quell the opposition he was facing. Two of these generals, Sir William Howe and John Burgoyne, were the major players in the events that would unravel in 1777. For them, another campaigning season was upon them and Germain needed the best plan on how to conduct it. 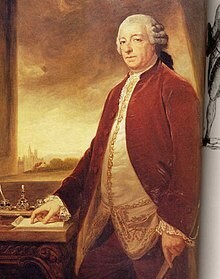 John Burgoyne was viewed by many as an arrogant man who wanted only to benefit himself. He left in December of 1776 for leave in England and once he arrived, he was at the desk of George Germain almost instantly. Before his arrival, he had devised a plan to invade the colonies from the Canada and laid it upon the desk of Germain at first chance he had. His plan called for a force under his command to march from Montreal, through the mountainous terrain of New York along the Hudson, and eventually rendezvous with General Howe who would move north from New York City with a much larger force to reinforce him. Additionally, a smaller British force would sweep through the Mohawk Valley from the west under the command of General St. Leger to bolster this movement. Together, the combined force would push it’s way across the New England colonies, the hot bed of the rebellion, in order to teach a lesson that the rest of the colonies would quickly learn from. To Burgoyne, the result of such an impressive show of force would be that everything that followed would simply fall back into place. To Germain, this was music to his ears. Ultimately, Germain would approve the plan on the condition that Burgoyne communicated and coordinated this with William Howe in New York. Howe, however, had different plans. William Howe, following his successes in 1776, wanted another prize: Philadelphia. This city was the largest in the colonies and it was the seat of power for the Continental Congress. Howe had his eyes set on this target for quite some time, but it’s capture just was not possible in 1776 with winter setting in and forcing his army to hunker down and postpone their campaigning (typically armies did not fight in the winter because they would not be able to move on difficult roads and wet weather soaked their gunpowder). Howe had written to Germain about his intended plans of taking the colonial capital, not by an overland expedition through New Jersey, but via a fleet of ships in coordination with his brother, Admiral Richard Howe. Germain also approved this plan. In layman’s terms, the British forces had two entirely different plans that were both approved by the Secretary of State. Already, one can see the confusion this would cause. John Burgoyne arrived back in the colonies in May 1777 and began to move his plan into action. The one costly blunder was, he had relied too heavily on William Howe in whom he had barely communicated with. Howe, who was gearing up for a campaign to capture Philadelphia, received correspondence from Burgoyne about his plans, but was so adamant on Philadelphia that he did not nearly fulfill his end of the bargain. 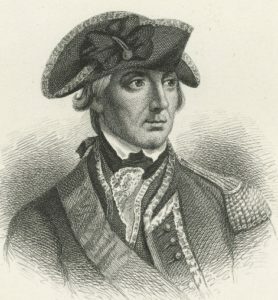 Henry Clinton, the third British general in the colonies, advised Howe that he and Burgoyne should coordinate better and that Howe should in fact stick to one plan: support Burgoyne, however, Howe being the commander in chief of the British forces should have had the ultimate say and he did. Howe finally wrote to Burgoyne, a message that would not get to him until early August, that he would be sailing for Philadelphia but had left roughly 3,000 British reserve troops in New York under General Clinton should he need any assistance. These 3,000 soldiers were not the 18,000 Burgoyne was depending on. John Burgoyne moved from Montreal into New York with his army, a massive baggage train, and permission to hire Native Americans as a support system. His expedition moved quickly at first. He captured Fort Ticonderoga from the Americans with ease, but upon moving father south and reaching the extreme density of the Hudson River Valley, his expeditionary force was quickly brought to a snail’s pace. Pressing on, took him nearly a month to move thirty miles because of the dense forests, lack of provisions and unsuccessful foraging parties, and obstacles put in place by a northern Continental army under Philip Schuyler. On August 9, 1777, after countless notes sent the Howe, he finally got Howe’s message that the commander in chief was not coming to his aid to reinforce his plans with the massive army, but instead was sailing to launch his plan of taking Philadelphia. Burgoyne was forced to press on without the necessary reinforcements and a logistical nightmare began to ensue. The fleet under Richard Howe with his brother’s forces on board endured a strenuous voyage. The time frame was anticipated as being shorter than reality dictated and the men were suffering on the tall sailing ships in the mid-Atlantic summer heat. Additionally, provisions became spoiled and were dwindling at a rapid rate. 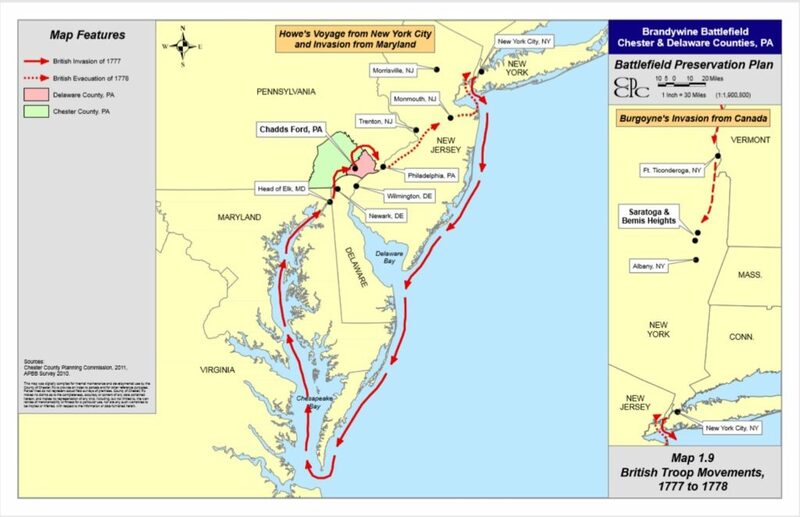 When the fleet disembarked in Maryland in late August 1777, the British forces were forced to forage for nearly three weeks before making any decisive move. This provided Washington ample time to move his forces into place with the assertion that Howe was going after Philadelphia. Washington moved from his strategic position outside of New York, through New Jersey, and into Philadelphia. In Washington’s mind, he was prepared to move north along the Hudson thinking that Howe would be moving to fortify it. Tactically, it was the only option Howe had according to Washington’s thinking and was strategically the best option. When Howe’s massive fleet of nearly 265 ships disappeared over the horizon after leaving New York harbor, Washington was genuinely perplexed. It wasn’t until the fleet was spotted off the mouth of the Delaware Bay, that Washington knew the intended target was Philadelphia. Moving overland through New Jersey, the Continental army marched into Philadelphia where it was paraded in front of the Congress to boost the morale of the soldiers before continuing south into Wilmington, Delaware. It was here that was Washington was anticipating the British to move and follow the course of the Delaware River into Philadelphia and move east from their landing point at the Head of Elk. Howe, however, had the advantage of employing local guides who informed him that an expedition along that route would be one full of obstacles provided by the terrain and waterways and would slow his army down. Howe instead moved through Maryland, the northern tip of Delaware, and into south eastern Pennsylvania. Every move Howe made was accompanied by his army foraging and surviving off the rich landscape, mills, and farms, resembling a plague of locusts in addition to an intimidating and professional fighting force. Howe and his generals, Wilhelm von Knyphausen and Charles Cornwallis, moved together in column until reaching the Pennsylvania/Delaware border. There, they split into two columns, again for the purpose of foraging. Washington, who was mirroring Howe’s movements in every regard, knew that General Howe only had one easily accessible road into Philadelphia with the way in which he was moving. This road was known in the 18th century as the Great Nottingham Road (modern day US Rt. 1). Washington and Howe played a game of “leap frog” throughout early September and once he realized Howe only had one major option of accessing Philadelphia, Washington moved his forces to Chadds Ford on September 9. It was there that he set up in a defensive position along the Brandywine River where the Great Nottingham Rd crossed it. Once in the area, he made his headquarters at the Benjamin Ring home, one of the historic homes on the Brandywine Battlefield Park grounds and held two councils of war with his officers on the nights of the 9th and 10th. The Continental army began building defenses and earthworks on the heights along the east side in order to prepare for the upcoming engagement to repel the British onslaught. The British army, moving into Chester County, Pennsylvania in two columns, came together and met in the small village of Kennett Square on September 10. Once at Kennett Square, they set up in two lines on the eastern and northern part of the village. At that point the two large armies were within five miles of each other. General Howe, with the assistance of local guides and the local population had the advantage before the engagement even started. He was given information that Washington had covered several fords, or crossing points, along the Brandywine River, but failed to guard to northern fords; Trimble’s and Jefferis’ Fords. 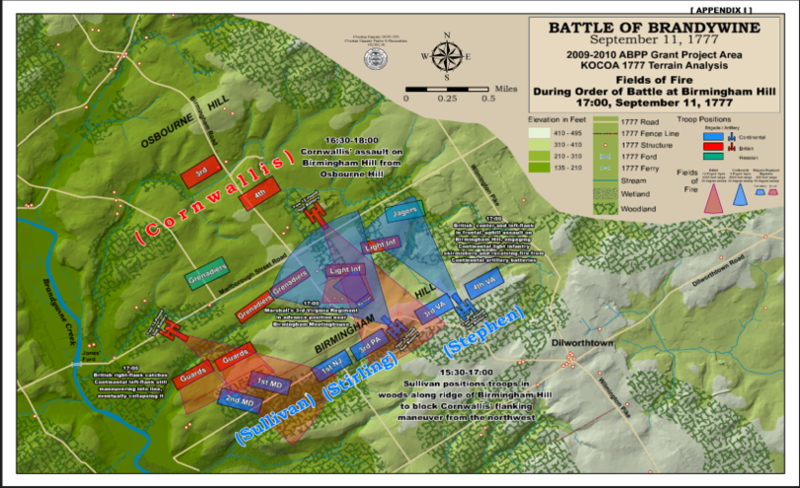 Howe devised his plan quickly and on the morning of September 11, 1777, he launched his assault on Washington leaving Kennett Square in two columns; one to the east and one to the north in order to complete a pincer movement and surround Washington’s army. The northern column, led by Cornwallis and accompanied by Howe, was comprised of the battle-hardened veteran soldiers of his forces and would consist of most of his army of roughly 10,000 troops. While they made a strenuous outflanking march to get maneuver around Washington’s right side at the two unguarded fords, General Knyphausen and a column of nearly 8,000 provincial and regular soldiers, artillery, and the army’s baggage would attack directly at Washington’s forces along the Brandywine in order to distract the American general and put up a ruse to dupe him into thinking he had the entire British army in front of him. Knyphausen was not to cross the river from the west until he heard Howe’s guns from the north. When that took place, a two-pronged attack would trap Washington in a pincer movement. The stage was set for the Battle of Brandywine. Below is a timeline of events that encompassed the day’s fighting. The morning of September 11 was foggy and exceptionally warm. Knyphausen’s forces camped on the eastern side of the village of Kennett Square began to form up into their column to make their way on an eastern course towards Washington’s main defenses on the Brandywine. Shortly after departing the eastern heights of Kennett Square, they quickly came under fire from American light infantry under William Maxwell who was camped around Welch’s Tavern (located around modern Longwood Gardens). This was where the opening shots of the battle took place, but it was short-lived as Maxwell and his approximately 300 soldiers were just the tip of a series of strategic positions positioned along the Great Nottingham Road in order to harass the oncoming British forces. After firing a minimal number of volleys, the Americans quickly fell back to a second area on an elevated position approximately 700 yards east of their initial one around the small village of Hamerton. Flanking either side of the single lane road and concealed by dense trees, fences, and other obstacles, the Americans waited for the British to approach before firing another small series of volleys and falling back again where they continued to join additional light infantry forces. This convinced the British that a cautious approach had to be taken because they were formed in a vulnerable marching column. The American harassment also slowed them down because the maneuver of taking the advanced guard of the column from column to line of battle to engage the skirmishers took time. Essentially, the British would be engaged, deploy, realize the Americans had fallen back, reform, and continue marching until they were engaged again. This was repeated several times that morning as the Americans fell back to positions around the Old Kennett Meetinghouse and others to the east. Eventually, after nearly two-three hours of harassment, the British were able to push their way to the west bank of the Brandywine and force Maxwell’s men to the eastern side with the rest of the American forces and deploy their men accordingly in order to distract Washington. As Knyphausen’s column was engaged along the Great Nottingham Road, Cornwallis and Howe were leading their elite column north along the Great Valley Road in order to reach the two unguarded fords. Washington had scouts and forward pickets on roads the ran east to west that were north of the Great Nottingham Road in order to report of any British movements in that sector. One group was under the command of Lt. Col Ross who had roughly 100 riflemen under his command who was positioned along the Street Road at the modern intersection of Doe Run Road today. This high point offered him a vantage point of the Great Nottingham Road, but also allowed him to look west and north. It was from this point that he witnessed the British marching column under Howe and Cornwallis and began to pursue. He wrote a report to Washington telling him of his findings. Knyphausen’s column had fanned itself out in order to make it seem like Washington had the entire British army in front of him. Following the deployment, a massive cannonade ensued that would make up most of the action throughout the morning hours and into the afternoon. This portion of the battle has often been deemed the “Mid-Morning/Afternoon Lull”. No significant troop movements take place, but both armies on either side of the Brandywine River around Chadds Ford gave everything they had in terms of Artillery to each other. Around 11:00am Washington received Lt. Col. Ross’s report about his sighting of the northern British column. This confirmed to Washington that there was only a small portion of Howe’s forces across from his position and Washington began to devise a plan to send a small force across the river in order to probe. At Brinton’s Ford, just north of Chadds, men began to cross, but it was short-lived. At roughly 11:20am, another report arrived in Washington’s hands. This report mentioned that a Major Joseph Spear of the Chester County Militia had witnessed no British force in the northern sector, which directly contradicted Ross’s report. How could there be confusion surrounding the sighting of an 10,000+ man marching column moving north along one of the only major roads at that time? It was simply a timing issue. Spear had been reporting from nearly 8 miles away and correspondence in the 18th century took time and effort to get from one point to another. Spear’s report, written before Ross’s report, had to travel a greater distance. With that, Ross’s report arrived in Washington’s hands before Spear’s did. Essentially, what should have gotten to Washington first, arrived second. 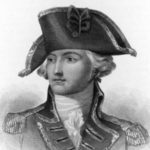 This now forced Washington to believe that the entire British army was in fact in front of him and he had to immediately pull his probing force back and not risk them moving into the jaws of Howe’s entire force. In utter confusion, Washington immediately sent Col. Theodorick Bland and the 1st Continental Dragoons to the north in order to get a precise report of what was taking place and because of this blunder, Howe and Cornwallis had the opportunity to cross the two unguarded fords unopposed. The British forces, now having the ability to cross unopposed at the northern fords, began to move south along Birmingham Road behind Washington’s lines. They stopped for a mid-afternoon meal on Osbourne Hill in order to refresh themselves and prepare for a large engagement. Theodorick Bland, who was riding north from Washington’s position arrived on a high eminence across from the British position and was shocked to find the British forces beginning to form up. He immediately hastened to get the report to Washington and in his report, he informed the American Commander in Chief that a large body of the enemy was forming up on the heights across from his position, but there was an elevated position in front of the British that could be used to repel an attack. This elevated position was Birmingham Hill, which surrounded the Birmingham Friends Meetinghouse. The Quaker meetinghouse was being used as a field hospital by the American forces at the time and unbeknownst to Washington, it ended up being caught directly in the middle of the heaviest combat. Washington immediately dispatched Generals William Alexander Stirling and Adam Stephen to move north with their divisions and form up on the hill. He then added an additional division under General John Sullivan to reinforce them. Stirling and Stephen moved as one body along existing roads and formed up adjacent to one another in good order. Sullivan, who was stationed around Brinton’s Ford, had his division spread thin. Regiments from his division were guarding the fords north of Brinton’s Ford and were stretched over a great distance. He first had to consolidate his forces and then move to reach Stirling and Stephen. 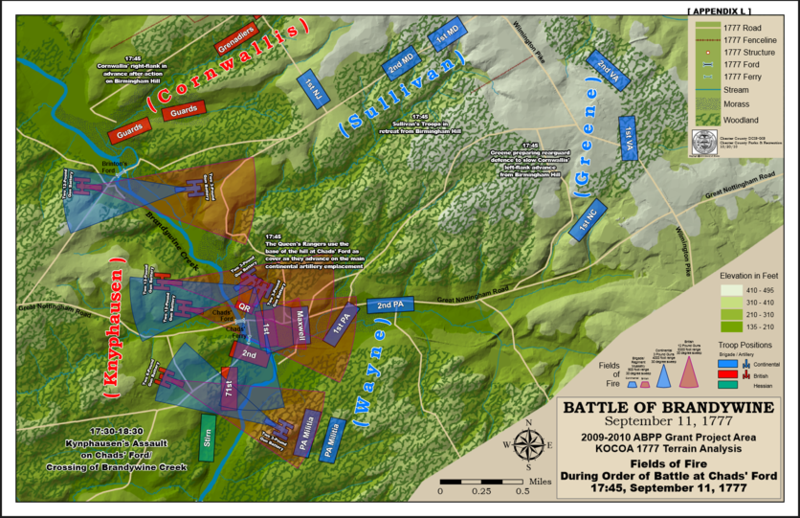 In addition to the time it took to consolidate, Sullivan’s men were forced to move overland fighting hilly and rocky terrain. They did not have the luxury of taking existing roads, but only had make shift cart paths and farm trails to follow if anything. By the time Sullivan reached the vicinity of Stephen and Stirling, he quickly realized that his division was entirely out of position as he was too far forward and left of the other two. Sullivan quickly rode to Stirling’s position in order to grasp a better understanding on what to do. This left his men under his second in command, General Prunhomme de Borre, who was a French officer who was not respected and who no one could understand because he barely spoke English. As this was all transpiring for the Americans, the British attack was about to commence. The British army began to form and launch their main attack at Birmingham. On the British right were the Brigade of Guards, the cream of the British military. At the center were the Grenadiers, another elite group comprised of the tallest and most formidable soldiers in the British army. To their left were the British light infantry and Hessian Jaegers, highly mobile units typically used as flank companies. Supporting the main line of British infantry were the Hessian Grenadiers and 3rd/4th Brigades. Unluckily enough for Sullivan’s men under Deborre, who were still entirely out of position, they had the elite Brigade of Guards directly across from their lines who bore down on them quickly. With mixed levels of experience, veteran soldiers fighting with untrained soldiers comprised Deborre’s men and did not stand a chance against the Guards and within a short time, they were completely routed from the field. 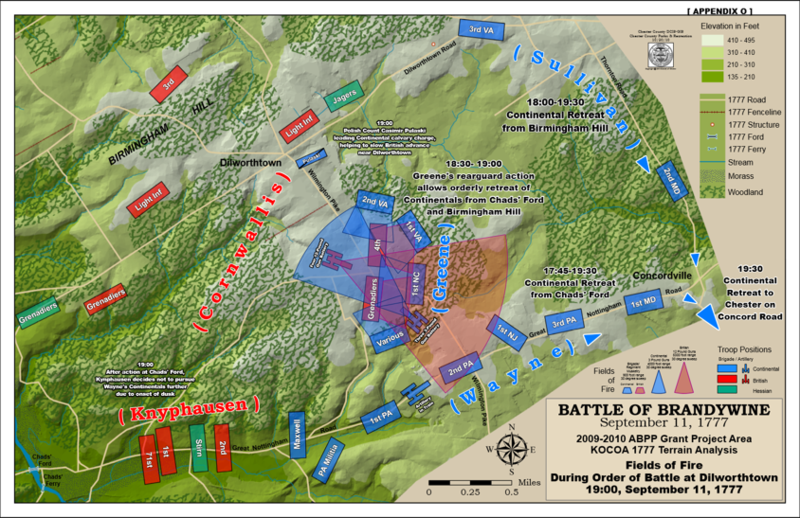 Stirling and Stephen’s division, however, were in a formidable position to repel the British onslaught. Luckily enough for Stirling and Stephen’s division, who were able to line up adjacent to one another, they were in a formidable position. As the Grenadiers and the light infantry charged up Birmingham Hill, they were repelled several times by the two divisions. As the attack unfolded, Washington and other officers, like the young Frenchman, the Marquis de Lafayette, finally arrived in the area of the attack to gain a better understanding of the situation. Over the course of approximately an hour and a half, the two divisions continued to withstand the British attack, engaged in fighting so fierce that some British officers later wrote that it was the heaviest they had ever seen in their long military careers. At the same time, Knyphausen, hearing the British attack from the north, began to push his men across the Brandywine River at Chadds Ford. Washington had only Generals Anthony Wayne, Maxwell, and Armstrong with the militia there to try and repel the assault. At first, General Nathanial Greene was acting as a reserve force for the three generals at Chadds Ford, but Washington began to realize that he could not overcome an attack on two fronts and had other plans for Greene. He ordered Greene’s division to make a daring 3-mile march to a position located adjacent to modern day Painter’s Crossing shopping center to form a rearguard for the retreating American forces. Greene’s men made the 3-mile march in a miraculous thirty-five minutes. It was there that he positioned his men in a crescent formation in a grove of trees. He was joined by men from Birmingham Hill that were falling back in a strategic way as the British slowly pursued them. British grenadiers and the reserve force of the 3rd Brigade slowly marched across an open field towards the position of Greene’s men. With the sun going down and impeding their ability to see clearly, Greene’s men opened fired, engulfed the British forces, and inflicted an enormous number of casualties. Howe, trying to reconcile this defensive stance, ordered the light infantry and jaegers to attempt to flank the right side of Greene’s rearguard, but that was also short-lived. A Polish cavalry officer, Casimir Pulaski, saw this and formed up what ever cavalry units he could in order to launch a cavalry charge at the British light infantry. Between Greene and Pulaski, Washington’s forces were able to retreat out of the area and down the road to Chester, Pa in an orderly fashion with Wayne, Armstrong, and Maxwell following closely behind the forces retreating from Birmingham. With the success of Greene’s rearguard, the darkness setting in, and the fatigue of the British soldier, Howe decided to not pursue Washington, but to stop all action for the day. His forces camped around the small village of Dilworth and the Birmingham Meetinghouse while Knyphausen’s men camped in and around our park grounds. All in all, some inhabitants took decades to recover from the occupation and most were not reimbursed for their hardship. The British left the area on September 16, 1777 and proceeded north into West Chester, PA (Turk’s Head in 1777) to try and intercept Washington and his forces. They found him in Goshen township where another battle that could have been as large as the Battle of Brandywine unfolded. As both armies fell into position, a large storm swept through the area and caused a torrential downpour of rain and wind. This occurrence, known today as the Battle of the Clouds, did not result in an actual fight and both armies retired from the field. Anthony Wayne and a detachment of the Pennsylvania regulars were surprised in a night time attack at Paoli on the evening of September 19, which is known as the Paoli Massacre. On September 26, General Cornwallis marched with a large British force, unopposed, into the colonial capitol of Philadelphia where they would remain until the spring. With the larger British force in Philadelphia, Howe set up a line of defensive positions that stretched north to the small town of Germantown, PA. Washington attempted one last assault on the British to capture Howe’s forces at Germantown and work his way down to capture Philadelphia. Not many people realize that the British, even having captured Philadelphia, were still suffering in terms of logistics. Although the army had made it’s way into the city, the Americans still held the Delaware River, which prevented any supplies or British shipping from accessing the port of the city to resupply the desperate Crown forces. The British navy battled their way up the river, dodging obstacles and bombarding Forts Mercer and Mifflin on either side of the river and engaging with small parties of Continental forces. After a long-fought bombardment, the two forts finally fell, and supplies were able to access the city. Washington, having no alternative, fled west to Whitemarsh and eventually on to his winter encampment at Valley Forge. The British had captured Philadelphia, but at a major cost. As the events of the Philadelphia Campaign transpired, another campaign was taking place in the northern theater of the war. General John Burgoyne, having been abandoned by General Howe in the summer of 1777, desperately and slowly continued to march his army south in the Hudson River Valley. With Howe out of the picture, he was left to forage and fight the Continentals in a totally unknown and foreign landscape. Generals Horatio Gates and Benedict Arnold with a large American force bolstered by New England militia harassed Burgoyne in every possible way. Little by little, Burgoyne’s force continued to suffer defeats when they were sent on foraging expeditions. Towns that were thought to be loyal and secure, turned out to be occupied by large bodies of militia and it all culminated at one place known as Bemis Heights, a major component in what would become the Saratoga Campaign. In October 1777, after a long and tedious expedition from Montreal, Burgoyne had no other alternative than to surrender one third of the British forces in North America. With the fall of Burgoyne, events turned in favor of the Continental cause. Across the Atlantic, King Louis XVI watched and waited for his opportunity to scribe his signature on a formal treaty with the Americans. Before this, France was unofficial allies with the Americans, but they needed satisfactory proof that the Americans could hold their own before France opted to officially get involved. France wanted nothing more than to fight Great Britain but having just lost a humiliating defeat in the Seven Years’ War (French and Indian War in North America), they were reluctant to jump feet first into the fray. The Saratoga Campaign along with Washington’s resilience in the Philadelphia Campaign was the evidence they were looking for and in 1778, France finally entered the war. Now the American Revolution, a colonial and continental war, was now a world war. England, feeling the pressure, had to relocate an already stretched military force from North America to other locations, particularly the Caribbean and other key footholds around the empire. General Howe caught blame for the events that transpired and put forth a letter of resignation to George Germain. He returned to England and left the British forces under the command of Sir Henry Clinton who would remain the Commander in Chief until the end of the war. In the spring of 1778, Clinton pulled the entire occupation force of the British army out of Philadelphia and marched them overland to the original location from which they left in the summer of 1777, New York City. Washington, having spent the winter in Valley Forge, had an army at his disposal that had been entirely transformed. Under the tutelage of the Baron de Steuben, the Continental army had been trained in proper European military drill and once they learned of the British withdrawal from Philadelphia, they set out to intercept the large retreating column in New Jersey. They did so around Monmouth Courthouse, where they proved that they were in fact transformed. Although considered a draw, Washington’s army maneuvered and stood their ground, which convinced reluctant eyes that the war was far from over. After arriving back in New York, Clinton set his eyes on the southern colonies where it was believed that there was an abundance of loyalists willing and ready to assist the British regulars in smashing the rebellion. He launched an expeditionary force under Charles Cornwallis that ended any major fighting in the northern portion of the colonies for the remainder of the war. As we think about the War for Independence, we remember the opening shots at Lexington and Concord, we remember Washington crossing the Delaware on Christmas night, and we remember the surrender at Yorktown. But we often forget, or maybe we do not even know of the Battle of Brandywine. Yet it was the largest battle in terms of combatants during the entire War for Independence. There were over 30,000 combatants – somewhat more than 15,000 for the British and somewhat less than 15,000 for the Americans. The battle took place on September 11, 1777. It is an easy date to remember. We all remember September 11 for another reason; and the year, 1777, was just over one year after the Declaration of Independence. Why was the battle fought? During the summer of 1777 British General William Howe was in New York City with a large force. General Washington did not know what Howe might be planning. There was a general suspicion that Howe would go up the Hudson River to join the British forces which were coming into upstate New York from Canada under General John Burgoyne. In July Howe started loading ships with men, horses, and supplies. Unbeknown to Washington, Howe had received permission to attack Philadelphia. When the 266 ship fleet, under the direction of General Howe’s brother Admiral Richard Howe, was spotted off the coast of southern New Jersey, Washington moved his forces south. When Washington learned that the fleet was in Chesapeake Bay, Washington now knew that Howe’s plan was to attack Philadelphia. After Howe’s fleet landed at Elk Ferry (southwest of present day Elkton), Maryland, Washington chose the Brandywine Creek as his site to defend Philadelphia. There were several skirmishes between the British and American forces as Howe moved up from Elk Ferry. Of these skirmishes, the most major was Cooch’s Bridge near present day Glasgow, Delaware. Washington selected Benjamin Ring’s house, about a mile east of Brandywine Creek, as his headquarters, arriving there on September 9, 1777. (The Ring House is available for tours at the Brandywine Battlefield Park.) General Howe encamped at Kennett Square, about seven miles west of Brandywine Creek. Washington had artillery, commanded by General Henry Knox, set up on both sides of the creek near Chads Ford. There were several fords on Brandywine Creek which needed to be used to cross the creek. Pyle’s Ford was defended by General John Armstrong. Chads Ford and Chads Ferry were defended by Generals Anthony Wayne and Nathaniel Greene. Brinton’s Ferry was defended by General John Sullivan. Three fords – Jones, Wister, and Buffington – were lightly defended by Colonel Moses Hazen’s Canadian Infernals. Washington was not aware of two more upstream fords – Trimble’s Ford on the West Branch and Jeffries Ford on the East Branch. At roughly 5:00 AM on September 11th, Howe marched out of Kennett Square. Not surprisingly, having used the same tactic at the Battle of Long Island, Howe divided his forces. He sent the Hessian General Wilhelm von Knyphausen straight east toward Brandywine Creek with approximately 7,100 men. General Howe, with General Charles Cornwallis, marched with approximately 8,500 men north on a flanking move to launch a surprise attack on Washington’s right flank. Howe was guided by Loyalist scouts to the unprotected fords – Trimble’s and Jeffries. The first shots of the battle happened at Welch’s Tavern which was located near the present day entrance to Longwood Gardens. Von Knyphausen’s men had several skirmishes along the way toward the Brandywine. Included in the British force was Major Patrick Ferguson who had invented a breech loading rifle. This weapon could get off twice as many rounds per minute than the other weapons used at the time and was extremely accurate because it was rifled. Ferguson had General Washington in his sights across the Brandywine but decided that he could not shoot an officer in the back. This act of chivalry avoided a real re-write of history! After traveling nine miles, Howe’s men completed the Trimble’s Ford crossing at 11: 00 AM. At noon they got to Jeffries Ford and were astonished that it was not defended. They then had to traverse a ravine on Birmingham Road. Captain Johann Ewald’s Hessian jägers led the way and could not believe that it too was undefended. When the forces got to Strode’s Mill, Howe ordered a rest so that his troops could partake of tea before the ensuing battle which would commence at 3:30 PM. Earlier in the day Squire Thomas Cheney warned Washington that the British were engaging a flanking movement. Washington ignored the warning. Later Washington got word from his officers. With this news, Washington moved his troops that he was holding in reserve near his headquarters north to the vicinity of the Birmingham Meeting House. Sullivan’s move from Brinton’s Ferry brought him to the left of the American lines and right into the attacking forces. Being the ranking commander, he had to maneuver to the right. This created a lot of confusion and heavy losses occurred. The heavy fighting on Birmingham Hill, around the Birmingham Meeting House, and in Sandy Hollow was fierce and ferocious. In most places land changed hands several times. When the American lines started to retreat, General Marquis de Lafayette was instrumental in turning the retreat. Lafayette was wounded in the area of Sandy Hollow. When Washington learned that Lafayette was wounded, he sent a physician and had James Monroe, who spoke French, accompany him. The battle ended at dusk. General Nathaniel Greene and Count Casimer Pulaski held off the British to allow an orderly retreat to Chester. When von Knyphausen heard the cannonade to the north, he had his forces attack at Chads Ford, eventually rolling up the Americans and crossing the creek. Soldiers engaged in the battle comprised a who’s who of the War for Independence. On the American side, in addition to the aforementioned – Washington, Knox, Armstrong, Wayne, Greene, Sullivan, Lafayette, Monroe, Pulaski – there was Lord Stirling, Alexander Hamilton, “Light Horse Harry” Lee, John Marshall, and Peter Muhlenberg. On the British side, in addition to those already mentioned – Howe, Cornwallis, von Knyphausen – there was Charles “No Flint” Grey, John Andre, James Grant, and Banistre Tarleton. Casualty (killed, wounded, and prisoners) numbers are not precisely known. Best estimates are that the British lost 500-600 and the Americans 1,000-1,300. Many Americans were buried in a mass grave at the Birmingham Meeting House. It was used as a hospital after the battle. Howe informed Washington that he did not have enough physicians or surgeons to care for all the wounded. As a result, Washington sent Dr. Benjamin Rush, a signer of the Declaration of Independence, under a flag of truce through the British lines to the Birmingham Meeting House. The British entered Philadelphia on September 26, 1777.